Last week for Friday Night Dinner, The Kid and I were out running errands and she asked if we could go for Thai food. I’m not sure why, but I just wasn’t feeling it. I love Thai so I agreed anyway but wasn’t sure what I’d end up ordering. I decided since I wasn’t in the mood, I was going to order something different than I usually do. I went with the Chicken Curry and had a choice of green or red. They’re similar but the red is a bit more spicy due to the chile peppers. I went green to be on the safe side. Hey, I was already venturing into something new. I didn’t want hot and spicy thrown on top. I guess my self reverse psychology worked because it turned out to be one of the best meals I’ve had in a long time! LOL. It was so good that I made my own version for dinner. It was lightning fast to throw together and hella cheap too. Most of the ingredients are those that I have on hand so I didn’t have to make a special trip to the store. It’s even faster to get on the table if you batch cook and have your rice and chicken ready to go. Cook the rice according to package directions. Just before the rice is done, mix the cilantro, curry paste, vinegar, soy sauce and almond milk in a blender or Magic Bullet. Blend until smooth. Heat a pan over medium heat, add the curry mixture and bring to a boil. Add the bok choy and chicken pieces, and simmer for about 4 minutes until the leaves wilt and the stems become tender. Stir every now and then to cook evenly. Remove from heat. 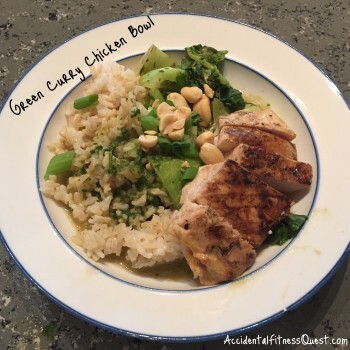 Divide rice into bowls and top with the curry sauce, chicken and bok choy. Sprinkle with peanuts and garnish with additional cilantro if desired. Makes 4 servings at approximately 348 calories – 27g protein, 42g carbs, and 9g fat. Seriously, how cool is this. Chop, blend, simmer, bowl, eat. If you have coconut milk, you can use that instead of the almond milk. I tend to make do with what I have and I usually have almond and soy milk, no coconut. You can easily sub in different proteins like tofu cubes, pork or steak. Next time when you aren’t in the mood for a certain type of food and you get out-voted, give something totally different a try and see what happens. You never know!